The Fat Boys in 1990. Left to right: Damon "Kool Rock-Ski" Wimbley, Darren "Buff Love" Robinson and Mark "Prince Markie Dee" Morales. 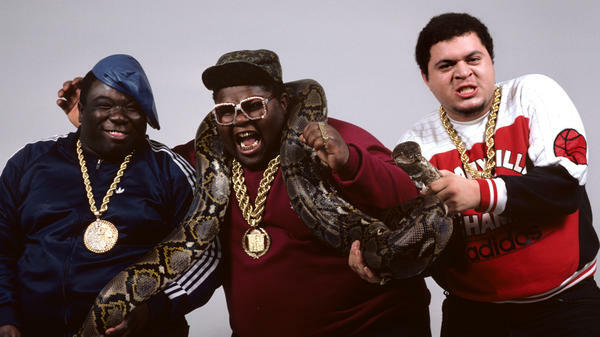 Before there was Heavy D, Chubb Rock or The Notorious B.I.G., there were the Fat Boys: Prince Markie Dee, Kool Rock-Ski and Buff Love, a.k.a. The Human Beat Box. You might remember the Fat Boys as a gimmick group, and there's a little truth to that. At the height of its career, toward the late 1980s, it cranked out a string of singles that basically remade or covered old rock 'n' roll hits, including "Louie, Louie," "The Twist" — and, of course, a chart-topping collaboration with The Beach Boys in "Wipeout." However, just a few years earlier, the Boys were hip-hop's most potent trio this side of Run-DMC. The Fat Boys' members first met in the early '80s at George Gershwin Junior High in east New York and formed themselves into a crew called The Disco 3. In the spring of 1983, they entered a talent contest at Radio City Music Hall, one of the most ambitious hip-hop events of the old-school era. Coca-Cola sponsored it, and 6,000 fans turned out. The Disco 3 walked away victorious, and event organizer and impresario Charlie Stettler took the group under his wing. In light of the members' substantial stature, he renamed them the Fat Boys. Kurtis Blow came in to help produce the group's self-titled debut. Fat Boys was recorded at a time of transition in hip-hop, between old-school, disco-influenced styles and a new, harder, sparser sound that was a natural fit with the staccato flows of MCs Markie Dee and Rock-Ski. However, no one packed more of a sonic punch on this album than Buff Love. He was one of the very first beat boxers to be recorded, and the album provided a showcase for what he could create with little more than spitting into his fist. The album reissue comes packaged in a cardboard miniature pizza box, a gesture that feels both loving and kitschy. And the CD itself has a few bonus tracks, including the crew's first single from when it was still The Disco 3. The Boys would eventually go on to much greater fame, but on this album, they're still young and still green, and they still sound — pardon the pun — hungry. New York rappers The Fat Boys were best known in the 1980s for a series of crossover pop hits recorded with everyone from the Beach Boys to Chubby Checker. By the '90s, the Fat Boys had faded from the spotlight. A new boxed set reissues their 1984 debut album and reviewer Oliver Wang says the big men packed more than just a gimmick. OLIVER WANG, BYLINE: Before there was Heavy D, or Chubb Rock or the Notorious B.I.G., there were the Fat Boys - Prince Markie Dee, Kool Rock-Ski and Buff Love, a.k.a. the Human Beat Box. UNIDENTIFIED MAN #1: (Rapping) Amazing to the eye (unintelligible) to the ear, and if you've never seen them, you wonder where his beats come from, machine or man, he's also cuttin' up 'cause he's in command. WANG: You might remember the Fat Boys as a gimmick group, and there's a little truth to that. At the height of their career, towards the late-1980s, they cranked out a string of singles that remade old rock 'n' roll hits, including "Louie, Louie," "The Twist" and, of course, their hit collaboration with The Beach Boys on "Wipeout." UNIDENTIFIED MAN #2: (Rapping) ...making lots of noise, when around the corner came the real Beach Boys. So we all jumped up and started to shout, let's all sing the song called "The Wipeout." WANG: However, just a few years earlier, the Fat Boys were hip-hop's most potent trio this side of Run-DMC. They first met in the early-'80s at George Gershwin Junior High in east New York and formed into a crew called The Disco 3. In the spring of 1983, they entered a talent contest at Radio City Music Hall, one of the most ambitious hip-hop events of the old-school era. They won and event organizer and impresario Charlie Stettler took them under his wing and, given their substantial stature, renamed them the Fat Boys. THE FAT BOYS: (Rapping) Now we may be a little chubby, but don't feel (unintelligible) we got to tell you one thing, we can surely come to the party and rock the house, as we (unintelligible), we can turn it out. So (unintelligible) smooth and take it from me, listen to the big sounds of the disco three, ha, ha. WANG: The Fat Boys album was recorded at a time of transition between the disco-influenced styles of the old school and a new, harder, sparser sound that was a natural fit with the staccato flows of Fat Boy MCs Markie Dee and Rock-Ski. However, no one packed more of a sonic punch on this album than Buff Love. He was one of the very first beat boxers to be recorded, and the album was a veritable showcase for what he could create with little more than spitting into his fist. BOYS: (Rapping) So check it out party people, it's the human beat box. WANG: The album reissue comes packaged in a mini cardboard pizza box, a gesture that feels both loving and kitschy. And the CD has a few bonus tracks, including the crew's first single when they were still The Disco 3. The Fat Boys would eventually go on to greater fame, but on this album, they're still young, still green, and they still sound, pardon the pun, hungry. CORNISH: Reviewer Oliver Wang is an assistant professor of sociology at California State University Long Beach and writes the audio blog, FullSize.com. BOYS: (Rapping) I thought to myself I could almost die, then an image appeared, a pizza pie. So I put on Addidas, headed out the door as I pictured myself... Transcript provided by NPR, Copyright NPR.